The banjo is a mainstay of American old-time music. The four or five string instrument is frequently associated with musicians who typically play country, folk and bluegrass music. The banjo is also often played by men. Here enters female banjoist Linda Hansen. Linda started playing the banjo after playing piano and guitar when she was younger. “My mother used to sing old fashion music songs to me. 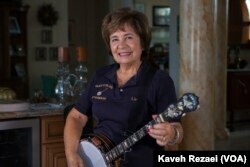 She played a mandolin in a family band during the Depression,” she recalls, referring to the years of hardship after the US stock market crash of 1929. As she got older and went to college Linda thought she would get a degree in music. A couple years into studying, she became interested in teaching children, and got her degree in education. The next thing Linda got was a guitar-tuned banjo. Linda taught elementary school in Edwardsville, Illinois. Teaching and playing songs on her banjo made the children happy as well as Linda. “The banjo was just a happy sounding instrument.” She says. And Linda recalls how making people happy is what she saw her father do. Linda evidently moved to Naples, Florida. She took a position in the School of Education at Florida Gulf Coast University. However, one thing was missing. “I heard you play the banjo.” English told her, and invited her to come sit in with the group and play with them. “I felt very comfortable with the ‘guys,’” she says. 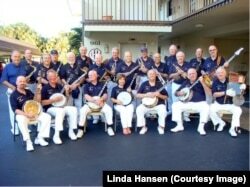 “They were nice and very fun loving.” The Marco Island Strummers are a group of retired professional men who are from all over the country. They play for the community of Marco Island and Naples where most of them live. The Strummers offer up a wide range of musical styles, anchored in what some may call “riverboat music,” a mix of patriotic songs, polkas, blues, old-time country songs, and a lot of Dixieland tunes. The Marco Island Strummers is named after Marco Island which is located in Southern Florida and where Hurricane Irma recently hit. The island is connected to the mainland by bridges south of the city of Naples. Irma’s powerful storm passed right through the island, leaving many to cope with power outages, no running water, no sewer service and fallen trees. Despite the hurricane, Linda’s warm and happy spirit continues to bring happiness to others. She and husband have been helping neighbors and family. She says the storm is a test of who you really are. And by the looks of Linda, playing the banjo and spreading happiness to others, Linda does both with grace and ease.